Staff Sgt. 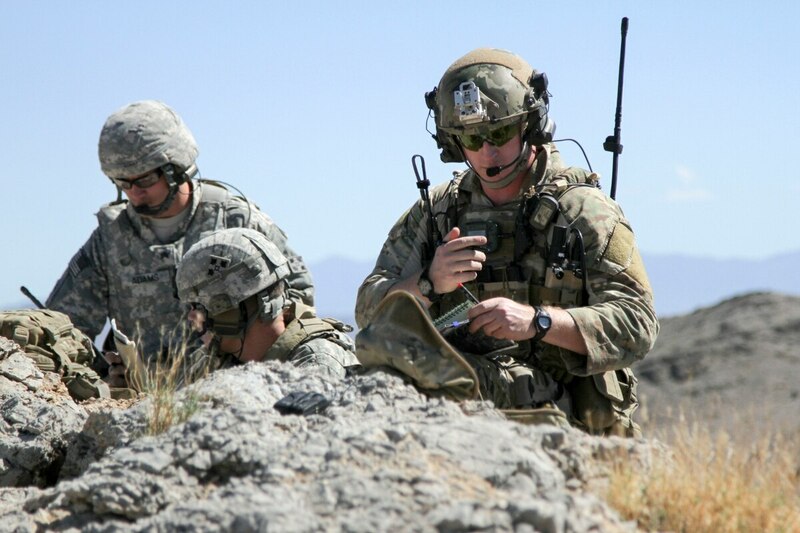 Derek (right), student Joint Terminal Attack COntroller, 13th Air Support Operations Squadron, 3rd Air Support Operations Group, Advanced Instructors Course, calls indirect fire from close air support as partr of the U.S. Air Force Weapons School during a joint training mission with Soldiers of C Battery, 2nd Battalion, 12th Field Artillery Regiment, 1st Stryker Brigade Combat Team, 4th Infantry Division, near Nellis Air Force Base, Nev. The Air Force will continue embedding joint terminal attack controllers in the Army's divisions even as the military battles with lawmakers over the future of the A-10 Thunderbolt II. The services are formalizing an agreement that's existed since Operations Iraqi and Enduring Freedom. Those wars are over, but with new emerging threats across the globe, both services see a need to foster a close relationship between JTACs and soldiers. "The Air Force has put tactical air controllers in large numbers in each one of our division headquarters," said Army Chief of Staff Gen. Ray Odierno during a recent meeting with reporters. "They are putting their people with our divisions to ensure we maintain and continue to maintain close-air support and the importance of it." JTACs are qualified to direct combat aircraft engaged in providing close-air support to ground troops and have the authority to control and call in airstrikes. Odierno said the two services must continue to work together to make sure ground troops have the support they need from the sky. "The close-air support being provided in Iraq and Afghanistan is very different from the close-air support you might need in Europe or in Korea," Odierno said. "We have to make sure we don't lose sight of how we do that. We have long conversations about that." Odierno said he is "confident" the Air Force is dedicated to providing close-air support to ground forces "today and into the future." "I'm not worried about that," he said. "What we have to make sure we understand, as we bring on these new systems [such as the Joint Strike Fighters], we have to understand how it works, how it will be used in a close-air support role, the new capabilities that will be brought, and how does that change close-air support." The two services also must synchronize its technological capabilities, Odierno said. This includes "our ability to see and communicate, the use of unmanned aerial vehicles, as well as attack helicopters," he said. "How does that link with Air Force close-air support? All of those discussions have to go on." The program to place JTACs in Army units is an exchange program, if you will, to support training and combat operations, said Lt. Col. Joseph Buccino, an Army spokesman. As part of the program, the Air Force has agreed to provide JTACs in support to Army corps, divisions and brigade combat teams. These JTACs are assigned to Air Support Operations Squadrons, and they are assigned to Army units as the mission dictates, Buccino said. Army commanders can request JTACs for specific training rotations or exercises; the JTACs also are resourced if the unit deploys, Buccino said. "As specific training missions or deployments develop, JTACs are identified for Army embedding," he said. The agreement allows for at least two JTACs at each corps and division headquarters. It also calls for at least two JTACs in each brigade combat team and the maneuver battalions in those BCTs, and at least one JTAC for each maneuver company or troop in the ready or available pool that has been identified for deployment. When the JTACs are in place, they work for and report to the Army commanders, Buccino said. As for the A-10, which is popular among ground pounders, Odierno said he's "very confident the Air Force can provide the appropriate close-air support without the A-10." The Air Force wants to retire the venerable but aging A-10 beginning in 2016 in an effort to save money. Several lawmakers on Capitol Hill have vowed to block that move even though Air Force officials have said the retirement plan would save $3.5 billion over five years. "It's not about not liking or not wanting the A-10," Air Force Chief of Staff Gen. Mark Welsh said at a State of the Air Force briefing in January. "It's about some very tough decisions that we have to make to recapitalize an Air Force for the threat 10 years from now." The plan mirrors what the Air Force submitted last year. Under that plan, active-duty units would be cut at Moody Air Force Base, Georgia; Nellis Air Force Base, Nevada; and Eglin Air Force Base, Florida. Air National Guard and Air Force Reserve units in Idaho, Maryland, Michigan, Indiana, Missouri and Arizona would receive replacement aircraft, either F-15s or F-16s. Several key lawmakers have already promised to block any plans to retire the Warthog, even before the Air Force submitted its budget plans. Senate Armed Services Committee Chairman Sen. John McCain, R-Ariz., has repeatedly vowed to keep the A-10 flying.